Arriving in Kigali, Rwanda, I was instantly struck by the temperate climate – I’d expected the sweatier climes I had grown used to when living in Ghana for a time. A dry heat in the high 20s: I can understand why it’s the perfect climate for successful agriculture. It was also hard not to be surprised by the condition of the roads – immaculate. (Far better than the pot-holed death-traps I’m used to in south east London…) But most welcome of all was the reception of the Rwandan people – warm, gentle and respectful. 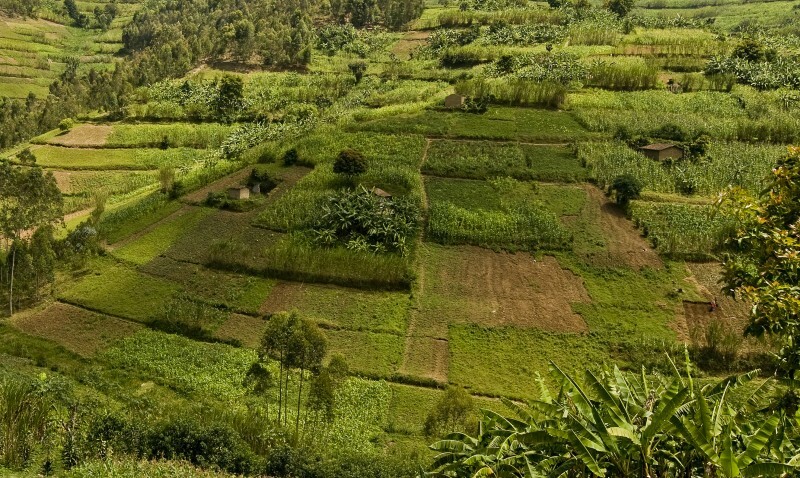 Rwanda’s rolling countryside is heavily cultivated. I was in Rwanda to visit three enterprises that were either already part of the Enterprise Development Programme (EDP) portfolio, or under consideration. 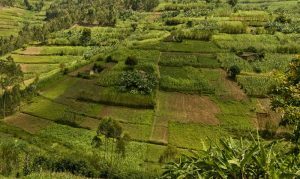 Travelling out of Kigali to Muhanga, a city in Rwanda’s Southern Province, it’s easy to see how Rwanda has become known as the ‘land of a thousand hills’; the rolling landscape is stunning, finely terraced with seemingly every available metre of earth packed with crops. It came as no surprise to learn that 80% of the population rely on agriculture for their main source of income. We were headed to Muhanga Food Processing Industries (MFPI), an enterprise set up to take advantage of this agro-economy. Processing soybeans, it is now one of the main processors of soy-based products in Rwanda, including tofu, soy milk and soy flour. But it’s important to understand the history of the enterprise, and the context of its inception. 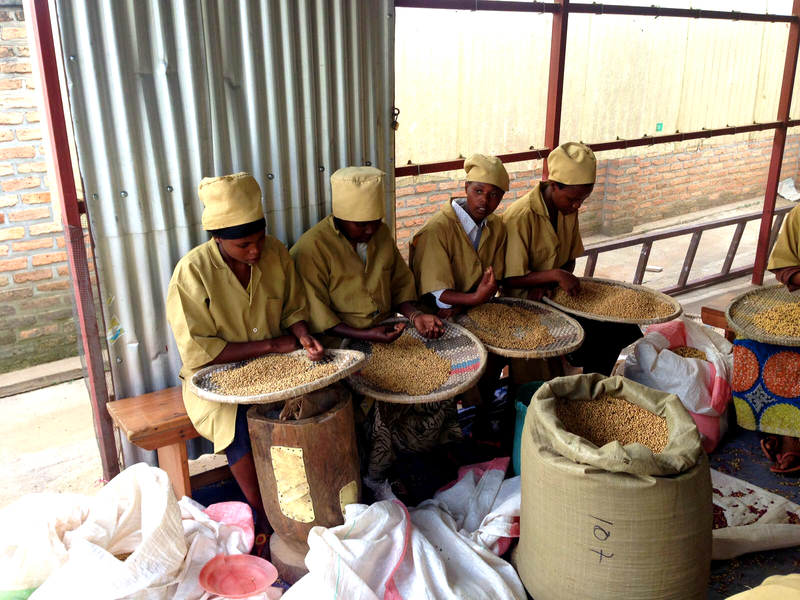 Workers at Muhanga Food Processing Industries, sorting soybeans ready for processing. The enterprise produces a number of soy-based items. In 1994, following the Rwandan genocide, a group of 77 women farmers set up Conseil Consultative des Femmes (COCOF): a co-operative aiming for social and economic development and regeneration, particularly amongst those widowed by the mass slaughter of 800,000 Rwandans – many Tutsis – between April and June of that year. Seeking to tackle the high levels of poverty being experienced, COCOF had a vision to help these women earn a living and tackle malnutrition rates. They began to teach women how to farm and process their crops, both for their own subsistence and to sell to the market. As their confidence, skill and resource grew, as well as their number (there are now 545 members), it became clear that they needed better access to market for their produce and, in 2004, they set up Muhanga Food Processing Industries (MFPI), eventually making the enterprise independent in 2014. While MFPI provides a stable market for COCOF members, and other suppliers, to sell their soybeans to, it also helps the soybean farmers negotiate a better price, and add value to their produce through processing. 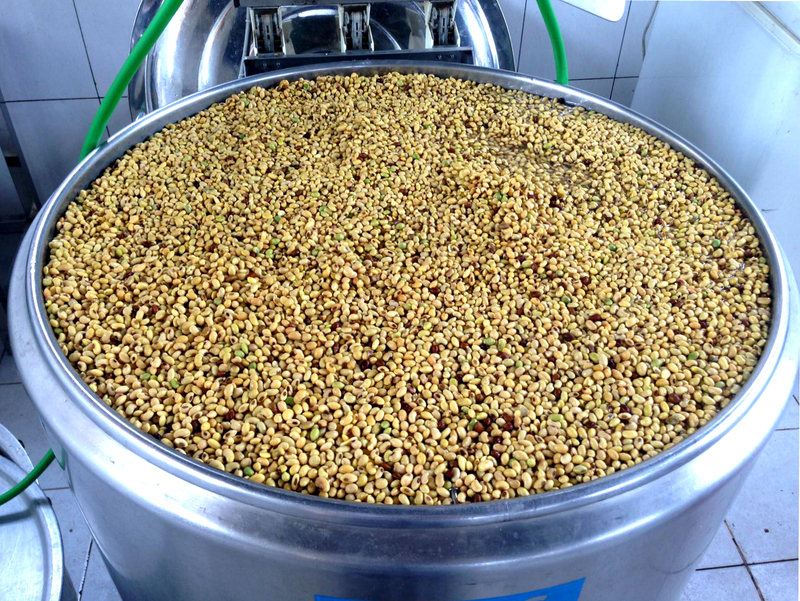 Soybeans ready to be processed by MFPI. MFPI now has a board and management team in place, but what encouraged me most was hearing that COCOF retain the majority shareholding, keeping control of the business that they have been so instrumental in forming and developing. COCOF employ an agronomist to ensure that the quality of seeds they produce for MFPI is high, while also negotiating contracts with MFPI and discouraging side selling to other enterprises or markets. At the time of my visit, MFPI was under consideration by EDP’s investment committee. Following a previous visit from one of the committee’s members, EDP had spent around 18 months working alongside the enterprise, conducting due diligence, and helping the board and management team grapple with some areas of weakness in accounting and safety standards. We also funded a local business development consultant to assess the business and advise on how potential EDP support could make the most difference. Marketing Manager Tharcisse Gihana showing me a selection of MFPI’s soy-based products. As with any enterprise, the management skills, motivation and commitment of the leadership are vital to success, and I had the pleasure of meeting some of the members of MFPI’s top team, including Desire Bitwayiki (Managing Director) and Tharcisse Gihana (Marketing Manager). Both are hugely passionate about the health benefits of soy-based products and the potential for future business growth in an expanding market. 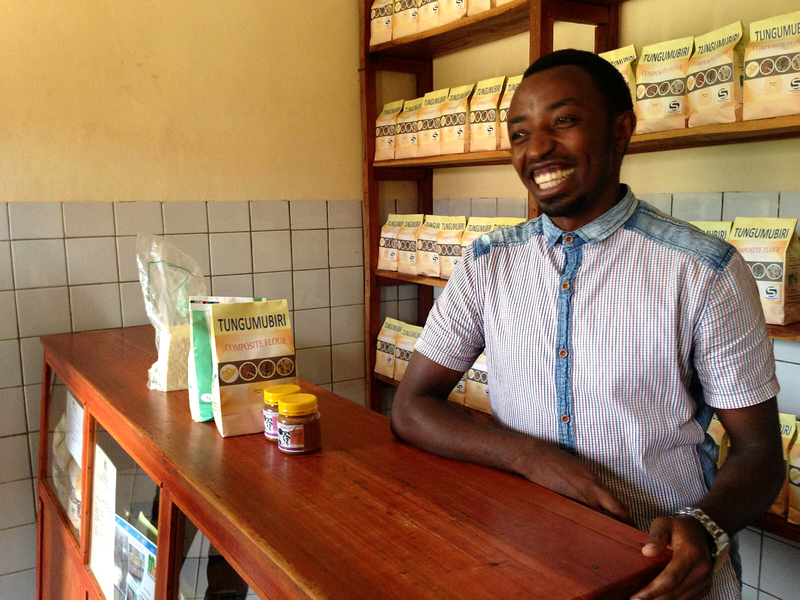 (Soy has been designated a priority crop by the Government of Rwanda.) Tharcisse is a fantastic recent addition to the team and – with a background in economics and experience running his own business – brings expertise, enthusiasm and a smile that is infectious. 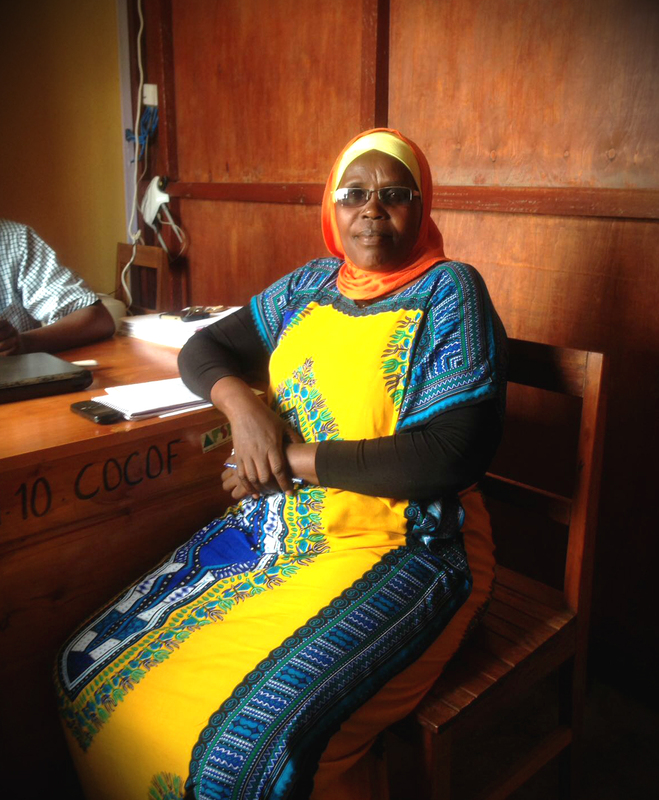 Madame Assiah, President of the COCOF co-operative, the founders and majority shareholders of MFPI. 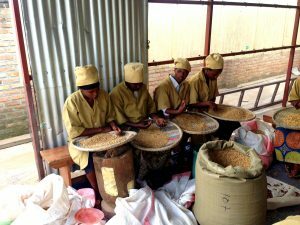 Since my return from Rwanda, MFPI has been fully approved as an EDP enterprise, and will receive just over £96,000 as a mix of loans, business support and social grant. The management team at MFPI have strong plans to increase annual sales by nearly 150% by 2019/20, generating an additional £716,000. This will directly benefit more than 4,000 suppliers, with their families and others also benefiting from the resulting increase in demand, production and profit. This will largely be achieved by supporting MFPI to increase the capacity at the processing plant, and improve the shelf life and marketing of their products with improved packaging. This is an exciting time for MFPI, with great potential for generating financial and social returns for thousands of people, their families and their communities. For Madame Assiah, President of COCOF and member of the MFPI Board, it is the next chapter in a story of hope born out of tragedy.